Our multi-activity days offer the opportunity to experience a range of exciting activities both on land and in the water. Some of the activites we run on multi-activity days include sailing, windsurfing, kayaking, archery, canoeing, climbing, katakanuing, raft building and stand up paddleboarding. These days are a great chance to meet new friends and have fun with siblings. These days are great for kids who are keen to get involved in a variety of land-based activities. 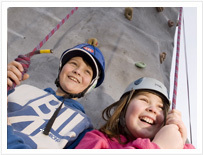 Our enthusiastic team lead a wide range of sessions covering Environmental, Adventure, Archery and Climbing. Our unique location offers opportunities for map reading, orienteering and shelter building, giving kids the chance to learn new skills and have fun. Our activity days start at 09:00 but if you need to drop your child off a little earlier, you are able to. During the drop off time, we have no activities planned so we suggest bringing a book or something to keep your child entertained for a short period of time. The earliest your child can arrive is 08:30. Places get booked up fast so don't miss out!